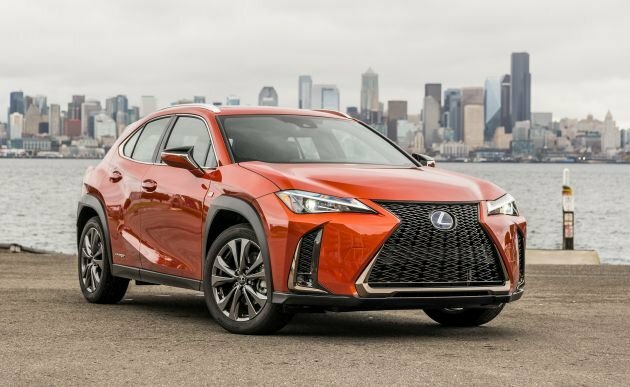 What changes will make the 2020 Lexus UX different? Hardly anything, as this surprisingly refined premium subcompact crossover heads into its sophomore season. “Urban + X-over (crossover) = UX” decodes the name, and this little five-seater does indeed shine as upscale city transport — although only the hybrid model qualifies as a true “crossover” because it has all-wheel drive (AWD); the gas version is front-wheel drive only. Still, the UX shrinks a laudable array of Lexus virtues into a distinctive alternative to such segment stalwarts as the Cadillac XT4, BMW X1, and Audi Q3. It’s also a less expensive path into the brand than the slightly larger Lexus NX, which competes alongside it in the premium compact crossover class. Starting around $33,500, the 2020 UX is apt to be not only their first Lexus, but for most buyers, their first luxury-grade vehicle. 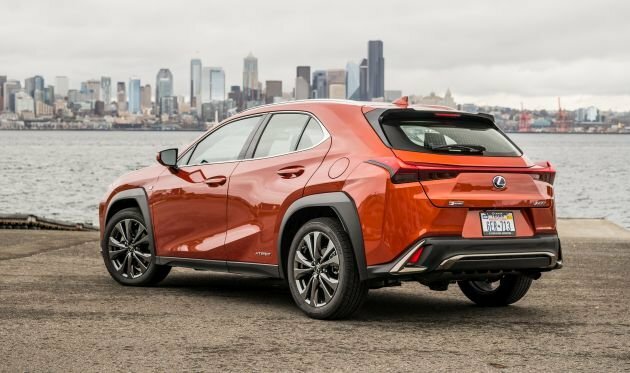 Note that driving impressions and other subjective conclusions in this review are based on road tests of the 2019 Lexus UX. Where the ’20 might be different, we’ll reserve judgment. Little reason to wait; the ’20 should be a virtual rerun of the 2019, but with somewhat higher prices. Don’t expect more significant changes until a midcycle refresh, around model-year 2022. The ’20 UX will reprise the four-cylinder front-wheel-drive UX 200 and the roughly $2,000-costlier, gas-electric-hybrid AWD UX 250h. Both should return in Base, snazzier F Sport, and top-line Luxury trim levels. At an EPA-rated 39 mpg city-highway combined, the 2020 UX hybrid will defend its standing as the most fuel-efficient vehicle in the class that isn’t a plug-in hybrid or a pure electric. Introduced for model-year 2019, the UX is a thoroughly gussied-up version of the far less expensive Toyota C-HR subcompact crossover from Lexus’s corporate parent. The C-HR is front-drive only, has different styling, less power, and no hybrid. The NX, meanwhile, is a Lexus-ized take on the 2013-2018-generation Toyota RAV. It comes in gas and hybrid form, both with AWD. A redesigned NX on the current RAV4 platform is due for model-year 2021. For better or worse, no. Lexus might offer some new colors but won’t alter the UX’s polarizing assemblage of edges and angles or tone down the big “spindle” grille that’s the face of the brand. The ’20 UX F Sports will again get their own mesh-pattern grille and fascia inserts, darker trim, and exclusive alloy wheels in the same 18-inch size used by the other models. Pleasing elements on every ’20 UX will again include “arrowhead” LED daytime running lamps and taillamps formed by 120 LEDs that start as baby-shark dorsals bridged by an illuminated band narrowing to just 1/8 inch thick. Nothing else in this class looks quite like it, so if turning heads tickles you, the UX is your MO. The ’20 UX will also remain fractionally smaller than every rival except the itty-bitty Buick Encore. That’s no problem for the driver and front passenger, who’ll get plenty of room on very supportive seats (with extra bolstering on F Sports). Rear occupants must negotiate rather tight doorways and while headroom and legroom are tolerable for those under 5-foot-10 or so, the bench is low relative to the window sills and front seatbacks, contributing to a closed-in feel. Fitting a child seat is a squeeze, and toddlers sit close enough to kick the front seatbacks. Also returning will be cabin design and décor that make this the Lexus of Lilliputian crossovers. It’s elegant and modern and, with one huge exception, functionally sound. Materials are used brilliantly. Stitched cushioning covers the dashtop, door armrests, and center-console top. The analog clock and thickly padded steering wheel are from the flagship Lexus LS sedan. The F Sport gets aluminum pedals and Luxury trims LED-lit vent controls. Many rivals offer leather upholstery; the UX employs an uncannily convincing substitute Lexus calls NuLuxe. Rare-for-this class amenities include an available power tilt/telescope steering column, automatic temperature maintenance for the heating front seats and steering wheel, and a nifty center-console lid double-hinged to open toward both driver and passenger. A TFT LCD display realistically duplicates analog instrumentation, with the F Sport cribbing the movable meter ring from Lexus’s high-performance cars. 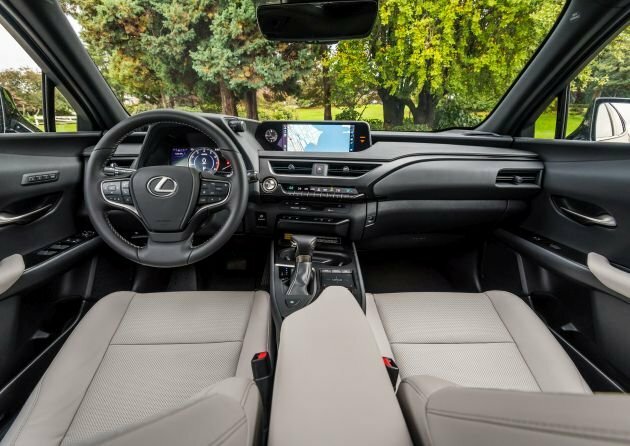 A housing stylishly centered atop the dashboard contains a crisply rendered 7-inch infotainment display or a 10.3-inch widescreen with the navigation system that should again be standard on the UX 250h Luxury trim and optional otherwise. Voice recognition can handle a range of commands, but the principal infotainment interface is a laptop-like touchpad to the right of the shift lever. Your fingertip movement is duplicated virtually on the screen, but the pad is far too sensitive in a moving vehicle and the result is a fugue of icon overshoots. A nearby plastic shelf has scrolling wheels for main audio functions, but they’re undersized and plasticky and among the few things here that don’t feel upscale. In all, this setup is anathema to driver concentration. Interior storage space is just adequate, and cargo room is a little below average for the class, with the XU 250h’s hybrid-drivetrain components intruding enough to reduce volume by three cubic feet or so. A hands-free power liftgate should return as standard on Luxury trims and an option for F Sport models. No. The 2020 UX 200 models will return with a 2.0-liter four-cylinder engine that’ll again have 169 horsepower and 151 pound-feet of torque. Four-cylinders of this displacement are ubiquitous in the segment, but most are turbocharged. The UX 200’s is not, and acceleration suffers, with slow response to throttle inputs and lazy pickup overall. Of little help is the excitement-sapping continuously variable transmission (CVT) that plays the role of a conventional automatic. Like other CVTs, it doesn’t have stepped gear ratios – except for a mechanical gearset used to get underway from a standstill. It’s an effective solution to a common CVT shortfall but can’t overcome the UX 200’s inherent power shortage. Noticeably livelier, if not blisteringly fast, is the UX 250h. The ’20 edition will return a 2.0-liter four-cylinder with electric-motor assist for a net 181 horsepower (Lexus doesn’t specify torque). This isn’t a plug-in hybrid, relying instead on energy recaptured during braking and coasting to recharge its nickel metal-hydride battery. The system automatically determines the best blend of gas and battery power, and the UX 250h can drive for brief periods on electricity alone. Lexus gives the driver an “EV” button to circumvent the gas engine and allow battery propulsion below about 25 mph, charge permitting. The UX 250h will continue to use a CVT, but without the UX 200’s mechanical gearset. Expect steering-wheel paddles enabling simulated manual gear-ratio control to return as standard on the F Sport and optional on the Luxury. Every 2020 UX will again be equipped with Lexus Drive Mode Select, which allows the driver to tailor the driving experience by selecting from three different drive modes. The differences are evident, but subtle. Normal mode balances driving performance and fuel efficiency; ECO maximizes mileage by moderating throttle response and air conditioning operation; Sport hastens throttle response and increases steering feel. With any 2020 UX, handling should remain a strength, with pleasantly firm steering and composed control in quick changes of direction. Standard again should be Active Cornering Assist that, in a turn, can apply braking to the inside wheels to help pivot the UX through the corner. Combined with tidy, city-parking-friendly tidy dimensions and excellent outward visibility, this is a crossover at home in the urban jungle. The front-drive UX 200 will noseplow if you speed into a sharp turn, but a notably stout structure and smartly tuned suspension help you maintain your line even through bumpy corners. Thanks to its AWD, the UX 250h feels even more surefooted. A dedicated 7-horsepower electric motor integrated into the rear differential automatically provides torque to the back wheels when accelerating, cornering, or driving on slippery surfaces. It works up to 43 mph, and isn’t intended for off-roading, but along with the electric assist, should again make the UX 250h unexpectedly entertaining. Ride quality is also a strength, and the ’20 UX should retain an amenable equilibrium between old-Lexus absorbency and new-Lexus sportiness. Either four-cylinder engine will drone during rapid acceleration as its CVT allows it to rev, but untoward noises are otherwise agreeably muffled. Unlikely. With carryover powertrains, expect 2020 UX EPA ratings to repeat those of 2019. That means 29/37/33 mpg city/highway/combined for the UX 200 and 41/38/39 mpg for the 300-pound-heavier UX 250h. Both ratings are outstanding for this class, and especially impressive given this little crossover’s premium feel. Our test 2019 UX 250h average 41.7 mpg in driving that included a fair share of 70-mph freeway work, a condition that does not use a hybrid powertrain to best advantage. Indeed, a hybrid’s strength is in low-speed and stop-and-go city driving, another arrow in the UX’s urban-crossover quiver. The UX 250h debuted Lexus’s Predictive Eco Drive Control. It’s designed to optimize fuel economy by learning driving habits, by coupling with the navigation system to predict the expected roadway ahead, and by analyzing real-time traffic reports. Related functions accumulate data on where the vehicle has slowed or stopped in the past to predictively increase regenerative braking when the driver releases the accelerator pedal. Probably not, so the ’20 UX will again offer just about every feature expected of a subcompact premium crossover. Every iteration will again include as standard the Lexus Safety System+ 2.0. This includes autonomous emergency braking designed to automatically stop the crossover to mitigate a collision with another vehicle, pedestrian, or bicyclist; adaptive cruise control to maintain a set distance from traffic ahead; and lane-maintaining automatic steering. Expect LED headlamps with automatic highbeams to remain included, as well. Oddly, blind-spot detection was optional for Base and F Sport trims on the 2019 UX; that useful driver assist ought to be standard across the board on a premium-class vehicle. It cost $500 as a stand-alone option and was included in the F Sport Premium Package. Also returning will be a system that automatically applies throttle or brakes to avoid contact with moving objects ahead or behind when parking; it cost $565 for 2019. Apple CarPlay was standard on the 2019 UX; it’d be nice if Lexus added Android Auto support on the ‘20. Returning will be a special CarPlay feature in which the streaming service complies driving-themed playlists; upbeat music for workdays, new releases from the streaming app Spotify on the weekends. Also back will be standard WiFi hotspot coverage. Expect the imbedded navigation system to return as a Luxury-trim standard and a $2,200 option otherwise. It’ll include the 10.3-inch screen and remote access to vehicle locks, engine start, and fuel-level readout from a smartwatch, Amazon Alexa or Google Assistant-enabled devices, and selected Android or Apple devices. Beyond features already mentioned, a power moonroof should return as standard on the Luxury grade and a $1,100 option on the other UXs. Same for a $1,660 upgrade to triple-beam LED headlamps with washers and LED cornering lamps. Look for the hands-free liftgate to again cost $600, a head-up instrument display to run $500, and wireless phone charging $75. Key options should again include a $1,175 Premium Package for base models that’ll add heated and ventilated front seats, the moonroof, rain-sensing windshield wipers, and an attractive dashboard skin inspired by the subtle grain of Japanese paper, known as washi. The $2,890 F Sport Luxury Package should again include all that, plus memory for the power driver seat, the blind spot monitor, and the hands-free liftgate. Among the few options expected to return for the Luxury grade will be a heated leather steering wheel with shift paddles at around $150. They’ll likely rise but remain slightly lower than those of most direct rivals. Lexus could temper any increase in the knowledge that the UX has been only a modest hit so far. Through spring 2019, it ranked sixth in a segment of 11 premium subcompact crossovers and in fact was outsold nearly 4-1 by Lexus’s own NX, itself No. 2 in the class to the Buick Encore. Base-price estimates here include the manufacturer’s destination fee, which was $1,025 on the 2019 UX. In the UX 200 line, estimated 2020 base prices are $33,700 for the Base model, $35,700 for the F Sport, and $38,900 for the Luxury trim. For 2020 UX 250h hybrids, estimated base prices are $35,700 for the Base model, $37,700 for the F Sport, and $41,900 for the Luxury trim. We tested a ’19 UX 250h Base model optioned with the navigation system, Premium Package, triple-beam LED headlamps, hands-free liftgate, blind spot monitor, wireless phone charger, parking assist, and a $100 windshield de-icer. It stickered for $42,060, including destination. By comparison, the 2019 NX 300h hybrid started at $39,830 and had more room, 194 horsepower, and an EPA-rated 31 mpg city-highway combined. Still, the UX, especially in hybrid form, has its own appeal as a fuel-frugal urban conveyance underpinned with the luxury touches, gold-standard reliability, and white-glove customer service associated with the Lexus brand. Expect a 2020 Lexus UX release date in fall 2019.